So this girl is a little stressed right now. Ok, a lot stressed right now. Because I am supposed to run a marathon on Sunday, and this marathon is one that I have been preparing to run (physically and mentally) the last 8 months. This marathon is also my DREAM race and I have coordinated a 5 day vacation around the event – complete with show tickets and dinner reservations. In case you haven’t turned on the TV, a hurricane decided to hit NYC and beat the city up pretty bad. The photos I have seen are unimaginable, and the damage is just plain crazy. The thought of the clean up to be done makes me so sad for the city residents. And through all these photos I have seen, news coverage I have watched, and articles I have read, I am still sitting here stressing out about whether or not I will get to fulfill my dream on Sunday and run in the New York City Marathon. How much more selfish could I be? This afternoon, I went out on my lunch break for a quick run. I needed to clear my head and most importantly I needed to get some perspective on the situation. While on my run I started thinking about the people affected by storm, and the people who lost their homes or even their loved ones. 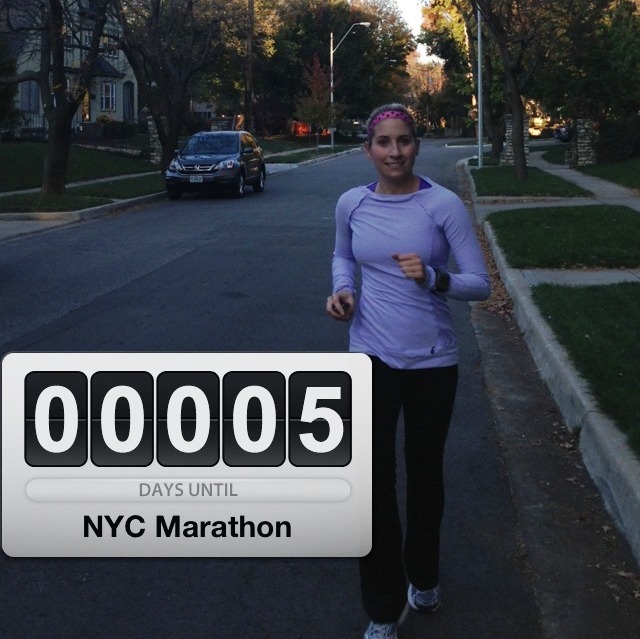 I realized that me not getting to run NYC this year is not the end of the world. It is just a very big letdown. And although I will be very sad and angry if that scenario plays out, I will live, and I will still have everything I had before. Which is more than some people can say right now. I am not giving up on my dream though. I don’t leave until Friday morning, so I am hoping that things will be up and running by then and I will be able to get into the city. Until I hear otherwise (and the amount I am checking twitter for race updates has got to be unhealthy), I will act as if I am running towards a dream on Sunday. And I will continue to envision the finish line in my head. Wishing everyone affected by this storm a speedy recovery process. You are in my thoughts and prayers! And as Nicole just reminded me, “Let Go and Let God”. He knows what’s best. 5 days people – let’s make it happen! Such a different outlook since I talked to you this morning. You can’t change the weather but you can change your attitude. Sounds like you’re doing good so far. I will think positive things about your flights. And if it’s meant to be it will be! Let go and let God. “Let Go and Let God” is one of the best ways to look at this. I think I will revise the post and add this in 🙂 Love you, Nic! I’m sure it won’t be canceled! A bit of shrubbery along the course? Probably. But canceled? No way! You got it!